One of the highlights of Sony’s F5, F55, and AXS-R5 new Version 3.0 Update is the ability to shoot Super 16mm format on the camera’s S35 sensor. There are countless 16mm lenses, zooms and primes. Many are languishing on shelves. Most are smaller and lighter than their 35mm cousins–and best of all, they have probably been paid for long ago. Since the F5/F55 cameras have a Super35 4K sensor, the smaller image diagonal of the S16 format occupies the sensor’s HD or 2K real estate comfortably. 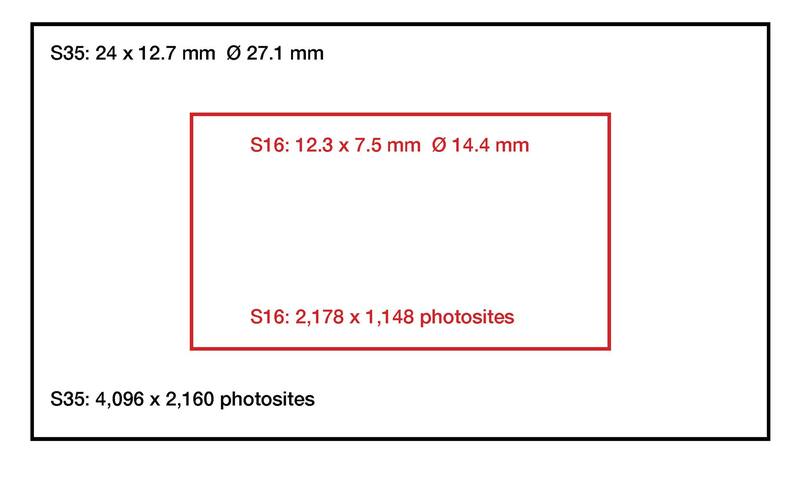 The new firmware crops and scales the image, similar to the process in a Nikon D800 that accepts both APS-C and full frame still formats. 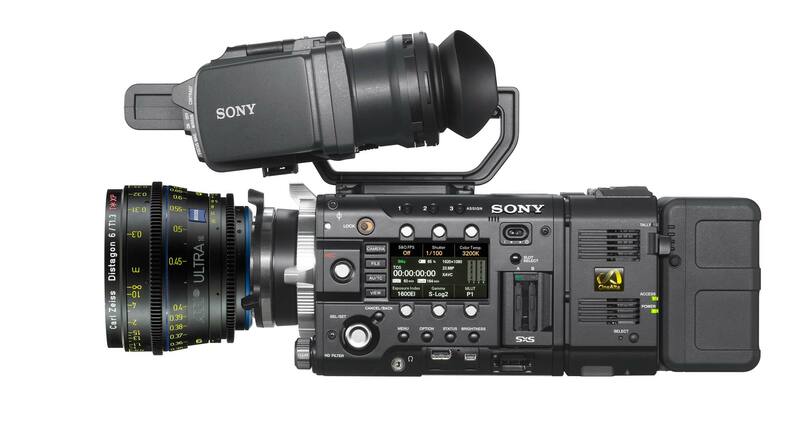 December was the Waypoint on Sony’s F5/F55 Roadmap for Version 3.0 release. They are right on schedule, with a few days to spare. F55 supports XAVC QFHD, 3840 × 2160 recording. Supported frame rates are 23.98PsF, 25.0PsF, 29.97PsF, 50.0P and 59.94P. F5/F55 frame rates of 50.0P and 59.94P. Video output format is HD 1280 × 720p or SD signal via SDI outputs. F55 gets Slow & Quick Motion when the recording format is XAVC 4K or QFHD at frame rate of 1 – 60 fps in 1 frame increments. In XAVC HD, available frame rates are 1-60, 72, 75, 80, 90, 96, 100, 110, 120, 125, 135, 144, 150, 160, 168, 175 and 180 fps when 23.98, 24.0, 29.97, or 59.94 is selected. And 1-60, 72, 75, 80, 90, 96, 100, 110, 120, 125, 135, 144 and 150 fps when 25.0 or 50.0 is selected. F5/F55 does Slow & Quick Motion in XAVC 2K, 2048 x 1080 with same frame rates as XAVC HD, above. RAW recording frame rates: 1-60, 72, 75, 80, 90, 96, 100, 110, 120, 125, 135, 144, 150, 160, 168, 175, 180 and 240. Choice of Center Scan mode or Full Scan mode in Slow and Quick motion for shooting above 60 fps. Lets you can use Super 16mm lenses and record XAVC HD, XAVC 2K, SStP and 2K RAW. Image is scaled (you don’t see it as a window within the larger 35mm frame). Digital audio input with AES/EBU format is available. Four channel audio inputs are available by two AES/EBU connectors. RAW output from the AXS-R5 attached to F5/F55 from SDI, HDMI and VF connectors on the PMW-F5/F55. Also selected MLUT is applied to RAW Playback signal. Up to 64 Scene Files and up to 64 Lens Files can be saved on an SD memory card. Saved files can be loaded to the internal memory. Cine-EI mode is selectable without AXS-R5. During SxS recording only, you can change Exposure Index. Adjusted for digital cinema (DCI-P3). User LUTs (1D and 3D) are added for Monitor LUT selection. User LUTs are created with Sony’s RAW Viewer V2.1. Up to 6 User LUTs can be stored on the internal memory via an SD card. Auto Iris for Sony FZ Zoom lens SCL-Z18X140, PL lenses that support Auto Iris, or Auto-Iris B4 lenses with Sony’s LA-FZB2 FZ-B4 Lens mount adapter. Frame lines can be turned On/Off independently in Viewfindfer and SDI/HDMI connected monitors. Hi/Low Key function as assignable button to check clipped highlights and crushed blacks. Works with MLUT ON outputs. To compensate gamma of low luminance scenes. At 59.94 or 50.0, an RGB 3G-Dual output (SMPTE ST424/425 Level-B). File name information can be embedded in the SDI output for use by external recorders and on-set color grading tools supporting clip metadata. Version 3.0 Firmware Updates and Documents can be downloaded directly from the Sony website. Read the fine print carefully: This firmware can be updated from V2.0, V2.10 and V2.11. When you want to update F55 and F5 from V1.22 and earlier, you must update to V2.0 first. For information about V2.0, see PMW-F55/F5 Firmware Version V2.0 Release notes (Oct 4th, 2013). F55/F5 must not be downgraded to previous versions after updating to V2.11. In addition, when you update and use F55/F5 with AXR-R5, you must update R5 to V3.0 at the same time.